Travel Disaster or Great Memory? One of the things I love about travel is how easy it is to make friends with other travelers. When my sister told me that her husband’s friend’s wife’s brother and his family were also living in the south of France, it was natural to invite them for a visit. It turned out great. Our new Canadian friends have a wine cave a few steps away from their house in France, so we went to try it out. The proprietor was away, and had left his son in charge. 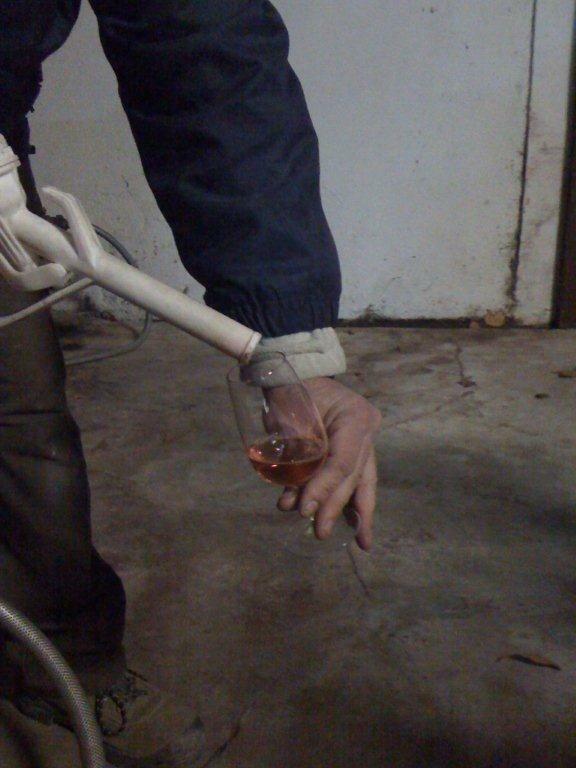 We told the son we were interested in wine tasting, and he invited us in. There was some lengthy chitchat, but no wine appeared. We were about to ask again, but another couple came in so we were sent to go check out the cave while he conducted some existing business. We gave ourselves a tour of the big vats of wine and looked at some scary machinery while we waited to be called back in, but apparently we’d been abandoned. We finally went back in and asked again. This time he pulled out some bottles, but emphasized that most of the wines they offered weren’t very good – we tried one and determined that he was right. There was more lengthy chitchat, and it turned out there was also some rosé, but he only sold it in big jugs so discouraged us from trying it. 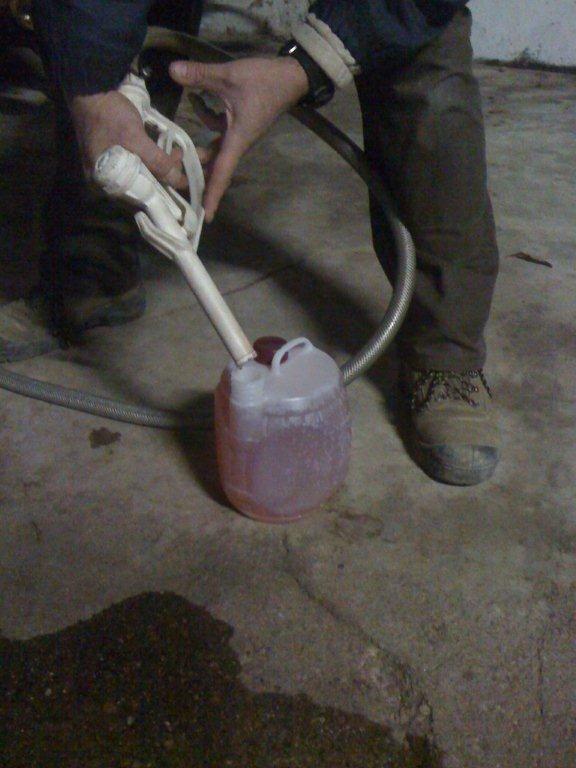 JM asked to taste the rosé anyway, so we all went back out to the cave where he filled our glasses straight from the big wine vat using the gasoline-nozzle-style attachment! It was not bad, so we asked what it cost. After a long discussion about the many ways that we would NOT be able to buy the rosé, we found out that we could buy a 3-liter plastic keg for 4€. As we finished our purchase, the world’s worst wine salesman proceeded to explain at some length that this was not an “appellation” wine (one of the quality controls in France), and they sold most of their wine to China since the French only drink better quality wine. We experienced the other end of the salesman spectrum when the Canadians came to Provence to return the visit. 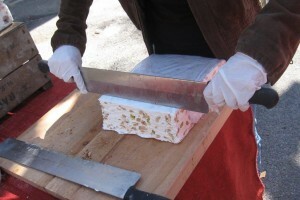 It was the last week of the famous truffle market in Richerenches. We had heard stories about the side street where truffle farmer’s park their cars and deal the famous mushrooms out of their trunks, so wanted to go see for ourselves. It turns out that some of the world’s BEST salespeople are at the truffle market. It was the last day of the market for the season, and we arrived one hour before closing with our cameras around our necks and our kids running around yelling in English. The lady selling nougat saw “tourists” coming and immediately started handing out generous tastings of candy to the kids. We said we would take some, since it was very good, but also in part because of guilt over how much the kids had eaten. The woman grabbed her huge knife, cut off a slab, wrapped it up and informed us it cost 32€!!! (About $45!!!) In comparison, the truffles we bought that are known to be incredibly expensive cost only 13€ ($18). You could call them disasters, but the stories of the world’s worst wine salesman and the world’s most expensive nougat will be revisited with laughter many times by both families. P.s. I probably wouldn’t have haggled too much with someone wielding a knife that size!! HI Lori. How great to hear from you. Definitely let’s connect. I’ll send an email. Love to talk to people about our experiences. Can’t just keep boring my family with the stories.